Why do you feel so strongly compelled to get close to be seen by to swim with dolphins and whales? They remind us of forgotten self, of freedom. Of possibility. They lead us easily to the elegant solution within, help us forget physical and emotional challenge… they are truly present moment beings. The biggest aura wins, and a pod of dolphins or just one whale, has a much bigger field of energy than that of a human being. We have our psychological reasons, sentimental reasons and they are each valid and poignant and personal. 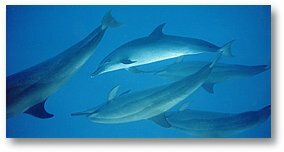 Sometimes sound is above and below the threshold of what the human ear can hear, and whales and dolphins are capable of emitting frequencies above the level of the ultrasound equipment your physical therapist or chiropractor has been using on your for tissue and blood stimulation and circulation. The dolphins are master acoustic therapists and we DEFINITELY have good reason to want to be around them . It is no coincidence that we tend to have a sense of rejuvenation, relaxation, and "feeling" of being more loving from experiencing their presence. Film footage of them, the sounds from them actually cause relaxation response as well. Different brain wave states have different corresponding physiological responses in the body and in the blood chemistry. We know the sleep state is delta, the awake aware externally oriented state is beta, and the emotionally open state is associated with theta. People that have been exposed to the dolphins register a brain wave state of theta. There is good reason to feel good from the experience- it even feels good to some people to spend time with other people that spend time studying the cetaceans (dolphins and whales are different sizes in the cetacean family, but related). The desire to be around water, to be around these beings is nothing other than our bodies showing wisdom. Your physical body got the" health buzz" the moment you thought about what it might be like to learn more to experience more. The healing property of sound cannot be overestimated. We have only begun to explore the power of sound, of acoustic therapy. You literally feel it in your bones because the frequency of the lowest octaves (what the song of the whales can do) sent through the medium of water (which travels 5 times faster than through the medium of air) is capable of dancing the bone cells. Sound literally dances us, our whole being. The last sense to leave us as we leave this earth is the sense of sound. The first sounds we hear as we are in gestation is the sound of amniotic fluid, mother's digestion and breath. When you relax, you can hear the sound of your heartbeat in your own ears. Sound has the ability to disrupt, disorganize, create chaos, and can also create beautiful harmony on the cellular level, emotionally, physically and psychologically. The dolphins and whales out in the oceans are at choice to come and meet and model information for us if we listen and are observant of their gifts. Ultimately they model power majesty and freedom, something each and every one of us wants for ourselves. They want it for and allow it of each other. I feel it, aha, I know it.